Airspan | APT is leading the 4G charge in Taiwan with Airspan’s multi-awarding-winning AirUnity the all-wireless indoor small cell. APT is leading the 4G charge in Taiwan with Airspan’s multi-awarding-winning AirUnity the all-wireless indoor small cell. LONDON–(BUSINESS WIRE)- – September 17, 2018. 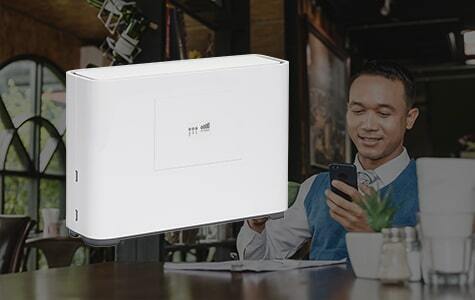 Asia Pacific Telecom (APT) has launched Taiwan’s first TD-LTE network on the 2.6GHz band using Airspan’s AirUnity, a multi-award-winning innovative all-wireless, plug-and-play, indoor small cell. Thanks to its integrated Backhaul and sophisticated AirSON algorithms AirUnity allows operators to improve data coverage and upload/download speeds on average by 300%. Thus revolutionizing deployment economics and breaking the barriers of traditional macro cell infrastructures. APT has introduced a number of innovative packages since launching 4G services including unlimited voice and data plans, and the nation’s first VoLTE offering that provides unmatched quality on 4G voice calls, voice over Wi-Fi. In addition, APT has eliminated roaming charges by offering free global calling. “We are excited to announce our partnership with Airspan for the deployment of their industry leading AirUnity small cells, we are delighted with the transformational benefits that this product has already delivered throughout our network,” said CP Chen CTO, APT. “Airspan over the past two years has proven its ability to innovate and dominate the small cell market. Our partnership with APT to revolutionize their network performance and the economics of deployment is an example of how we can extend our multi-award-winning solutions, like AirUnity to global markets.” said, Henrik Smith-Petersen, Chief Sales and Marketing Officer, Airspan Networks. APT is committed to providing the best 4G experience in Taiwan and has been steadily improving its network connectivity and coverage. Deployment of AirUnity enables APT to provide a rapid cost-effective network across Taiwan’s shopping areas, night markets, and other high-density areas, resulting in greatly improved indoor coverage and capacity. Removes the need for permits, site rental, power and professional installations, thus enabling APT to deploy and operate at a fraction of traditional costs. Reduces service-provision costs and shortens service actuation time to just minutes after power-on via AirSON self-configuration and self-optimizing operations. Directional High Gain MiMO Antennas and integrated backhaul technology deliver ~25dB better link budget than the typical Smartphone, and better SINR performance, giving the most advanced smartphone users the best possible experience. AirUnity provides indoor coverage of approximately 3000sqm and extends outdoor coverage up to 100m. Each unit off-loads edge users from the existing Macro RAN and improves overall RAN capacity. APT and Airspan are delivering on the promised benefits of small cells through innovative design, advanced technology implementation, and intelligent operation principals. AirUnity uses the powerful Qualcomm FSM chipset and Airspan’s Zero-touch AirSON, which automatically configures wireless-backhaul and optimizes the system and network using advanced interference mitigation techniques to avoid previous high-density small cell interference issues and greatly reduce operational costs. Airspan enables APT to provide an advanced, high-performance 4G network in Taiwan and most of all allows it to lay the foundation for future 5G services. Airspan (OTC PINK: AIRO) is a leading 4G and 5G RAN solution provider, with over 1000 customers in over 100 countries. Airspan is regularly recognized as a leader and pioneer in LTE Access and innovative Backhaul solutions. Airspan has an expansive product portfolio, which includes indoor and outdoor small cells, and all-outdoor, compact Micro and Macro base stations, a variety of user devices and network optimization products. These connectivity solutions operate in bands from 400 MHz up to 6.4 GHz and 60-80GHz millimeter wave. Airspan is not subject to the informational reporting requirements of the Securities Exchange Act of 1934 and, accordingly, does not file reports, financial statements, proxy statements, information statements or other information with the Securities and Exchange Commission. This press release may contain forward-looking statements. We may not actually achieve the plans, intentions or expectations disclosed in our forward-looking statements and you should not place undue reliance on our forward-looking statements. We do not assume any obligation to update any forward-looking statements. Asia Pacific Telecom Co., Ltd. provides telecommunication services to personal and business users primarily in Taiwan. Its services include broadband fixed line, broadband mobile communication, and broadband Internet services. The company was founded in 2000 and is based in Taipei, Taiwan.